Cloth diapers can save money (despite a substantial initial investment) and reduce landfill waste, but they also require more effort to clean. All diapers smell, almost by definition. However, the smell of cloth diapers can linger long beyond trash day and spread far beyond the nursery if the diapers aren’t washed and handled properly. I have been using cloth diapers and following most of these rules for the first 11 months of my baby’s life, and I'm happy to say that the guidelines not only work, they're easy to follow. • Change diapers regularly during the day. Soiled diapers should be changed immediately, both to avoid diaper rash and reduce odors. Wet diapers should be changed every two to three hours. This will keep baby more comfortable, and will avoid stale urine smells. 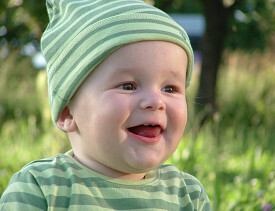 Babies urinate about 20 times a day. Fresh urine should smell very little, but the salts in urine gradually break down into pungent ammonia. • Change the baby once at night. After a few months, babies no longer regularly poop at night, but you could still have 12 hours of pee breaking down into ammonia in an overnight diaper (assuming you're blessed with a good sleeper). Keep the lights dim, and a quick overnight change will barely wake Baby. Full disclosure: this is one rule I do not follow. I don’t think it’s worth the trouble, and I use an overnight double liner to keep Baby’s bum dry. To be sure, the smell of his overnight diaper really wakes me up in the morning, but I take care of the smell fairly quickly. • Rinse diapers. Scrape or rinse all solid waste out of diapers. Some parents spray off urine into the toilet, but most put wet diapers straight into the pail and use a rinse cycle (see more below). • Use an open diaper pail or bag. It may seem counterintuitive, but leaving the diaper pail lid cracked will allow more air circulation and reduce smells. Also wipe down the inside of the pail with bleach or baking soda regularly, and air out the pail in disinfecting sunshine while laundering diapers, if possible. • Place a room deodorizer near the diaper pail. I use a vented fridge box of baking soda. Other parents swear by coffee grounds or the Nature’s Air Sponge odor absorber. There are plenty of DIY, non-toxic home deodorizers. • Wash cloth diapers every two days. Washing every day will really cut down odors, but is impractical. Don’t overload the machine, or the diapers won’t get clean. Likewise, if the machine is less than half full, add a soaked towel or two to “trick” the washing machine into using more water. Modern washers calibrate water levels to the amount of laundry they sense in the tub. • Start with a cold-water rinse cycle. You needn’t use any detergent in this cycle, but if the diapers smell strongly of ammonia, try washing in vinegar, then rinsing the diapers well. Be sure never to mix vinegar and bleach, as they combine to form a deadly gas. High-efficiency washers that minimize water and energy use may require two or three rinse cycles. • Wash in hot water with a small amount of "green"detergent that doesn’t have dyes, enzymes, softeners or fabric enhancers. I recommend Mountain Green Baby Free & Clear detergent. Start by washing diapers with half the recommended amount of detergent for a regular load, and adjust as needed. Detergent residue often causes diaper odors, as well as rashes and leaks. • For serious lingering odors, add a small amount of bleach to the hot wash cycle, and rinse thoroughly. • Line dry diapers. Don’t underestimate the disinfecting, deodorizing power of the sun. This will also significantly reduce the environmental impact of using cloth diapers. This cleaning routine should reduce diaper odors. The steps may seem overly complicated, but they'll quickly become second nature. You may need to revisit the routine, and even the decision to use cloth diapers, after baby starts eating solid foods. One couple I know ditched the cloth for disposables after their baby turned one, his diet turned more diverse and his diapers turned more stinky. Of course, used disposable diapers are far from unscented, but several of these rules still apply. Changing disposables regularly, and using an open diaper pail and a deodorizer should help take care of diaper smells.